Companies rely heavily on their IP team’s technology expertise, competitive research and analysis, and product development counseling to drive the business forward. However, evaluating a corporation’s IP portfolio together with market research and analysis must produce actionable insight. This is a tall order for executives. 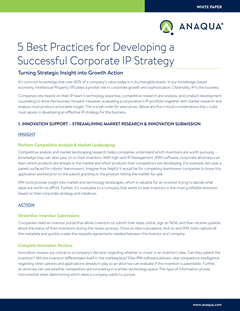 In this white paper, learn about five critical considerations the c-suite must assess in developing an effective IP strategy for the business.